The prophet who protected King David's legacy. Nathan the prophet was an adviser to King David and a key supporter of Solomon in his successful quest to succeed David. His brother Joel was one of The Thirty, an elite group in King David’s army. David told Nathan that he was unhappy with the fact that he lived in a mansion of cedar, while the Ark of the Covenant was in a tent, surrounded only by curtains. Nathan’s first reaction was to tell David to do whatever was in his mind because God was with him; however, that same night, God appeared to Nathan in a vision and told him to say to David that his son would be the one to build the Temple, not David. After David sent Uriah to his death and hastily married his pregnant widow Bathsheba, Nathan came to David and told him a parable of a rich man who owned many sheep but took his poor neighbor’s lamb and cooked it to honor a traveler. David, not understanding the allusion, became angry and threatened to punish the rich man for his lack of pity. Nathan told him (2 Samuel 12:7): “That man is you!” David then recognized that he had sinned. Nathan told him that he would not die, but the baby would. The baby became seriously ill and died. Later, Bathsheba gave birth to another son, whom they called Solomon, but who was named Jedidiah by Nathan. 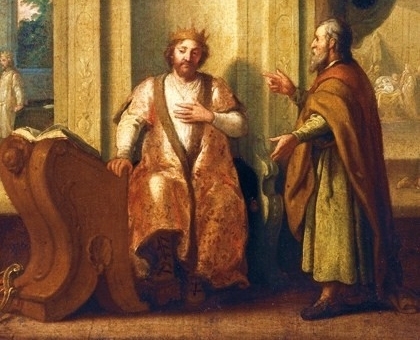 David grew old, and the succession to the throne, after the death of Amnon and Absalom, was disputed between Adonijah, the eldest remaining son, and Solomon son of Bathsheba. Joab, the commander of the army, and Abiathar the Priest supported Adonijah, whereas Nathan, the priest Zadok, Benaiah, and other powerful men wanted Solomon to be king. Nathan added that while she was talking with the king he would come in and confirm her words. Their ploy succeeded, and David commanded Nathan and Zadok to take Solomon on the royal mule to the spring of Gihon and anoint him king. After the death of David, Solomon placed the sons of Nathan in high positions: Azariah was in charge of the officials responsible for the 12 tax districts, and Zabud became the trusted adviser of the king. 2 Chronicles 9:29 mentions that Nathan wrote a book about the reign of King Solomon, but it has not survived to our days. Solomon the Wise, one of King David's three sons, built a truly organized and centralized monarchy. Moses's brother helped lead the Israelites to freedom.